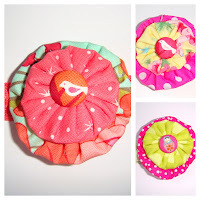 Today's 'All Things Nice' post features Natalie from Little Puddles Custom Jewellery. Natalie's accessories for little people can be found at our Sugar & Spice, June 5, Woodend Market and Ballarat in both July and November. I would like to think I am more sugar, but I think I am naturally more spice...I will leave it up to others to come to their own conclusion! I would like to say it is because I had some kind of calling, but it's because I have an addiction to jewellery, accessories, and homewares...and when I started crafting products for myself, I found that my friends and family were interested in purchasing these from me! It was a huge compliment and from this, I have expanded into a mini-empire (in my dreams!) which now includes accessories for my beautiful baby girl, Emily Mae. I love this question...my mum is Welsh and her maiden name is Poole. She is one of 12 kids. When her mum (my grandma) used to go for walks with the family, people used to say, 'There goes Mrs Poole and all her Little Puddles'. 1. MaeBaby Headbands! I made these for Emily Mae because a lot of the headbands sold at retail outlets were too tight for her head and had 'bits' in them that made them unsafe for babies like Emily who put everything in their mouth...these are completely safe and so soft and stretchy that even I can wear them! 2. Bunting! So much fun to create and I am absolutely addicted to crafting with fabric, so making custom orders for people completely makes my day! I'm currently sewing a set for Emily's first birthday in a gorgeous mix of reds and pinks.